King Lathas' Training Camp is a member's only location and cannot be accessed until you have completed Biohazard. 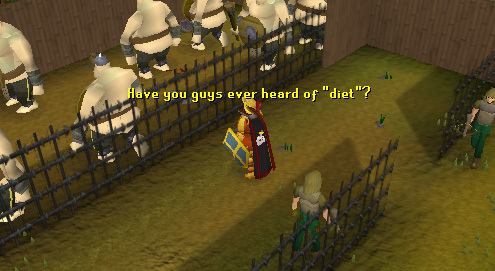 It is located northwest of East Ardougne and southeast of the Tree Gnome Stronghold. This area might be small, but it does have useful features for training. It even has a weapons shop. There is no way to teleport here, so your only option is to walk. 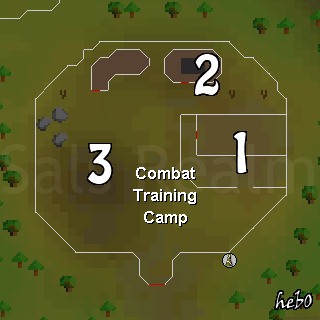 However, you can teleport to nearby locations and walk a short distance to the camp. 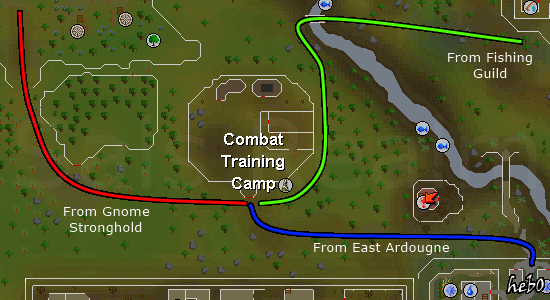 East Ardougne has a teleport spell, and the city is a short walk away from the camp. You could also use Gnome Gliders or Spirit Trees to teleport to the Tree Gnome Stronghold. If your spell book is on Lunar Magics, then you can teleport to the Fishing Guild and walk to the camp. This part of the camp is the most popular. Here you can find eight ogres trapped behind a fence. They can be maged or ranged at. It's not recommended, but you can also use a halberd on these ogres. Most rangers will power-range these ogres, meaning they don't pick up their arrows after they shoot them. However, if you do want to pick up your arrows or the drops from the ogres, there is a loose railing on the west part of the gate, which you can squeeze through. Ogres mainly drop big bones and seeds used for farming. Wandering around this area is a guard. There are guards all around this camp, so get used to them. This guard will tell you about the ogres and why they are here in the camp. If you go a little bit south, you can find another guard, and a table with a beer respawn. To the north of the Ogre training area is a small house with three guards. The three guards will say the same thing, "What do you want - Leave us be!". It would be best not to bother them. Outside the house you can find another table with a beer respawn. Heading southwest, you can find an area with thirteen dummies. These are not human dummies, they are sandbag dummies used for combat training. You can hit them a few times, but you won't get much experience. After a while, you will start getting the message "There's no more to learn from hitting this dummy". Around the dummy area you can find some more guards. There is one shop in this area, and it's pretty useful. A lot of people don't know about this shop because there isn't an icon for it on the mini-map. Head north of the dummy area to find a building with a Shop Keeper. Trade with him to view his goods. If you don't want to buy anything, then you can talk with a guard in the same building, or head southeast to find another table with a beer on it. There are guards found all around the camp, although they all look the same. The only person that looks different is the Shop Keeper. There are only a total of eight ogres for you to kill here.